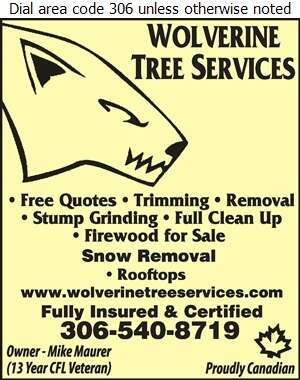 Wolverine Tree Services help keep your outdoor spaces safe and neat. If you have a tree that has grown too much for you to handle, we can assist you with the removal. Dead branches, over grown branches, saplings sprouting, all of these issues can become dangerous if not taken care of. We can trim trees or cut them down and remove the stump making your yard more open and safe. We even do full clean ups leaving you with no mess and no sign we or the tree were ever there. In the winter, if you fear there is too much snow bearing down on your roof, we can come and remove that for you too. We are fully insured and certified, so whenever you need a tree taken care of, call Wolverine Tree Services.